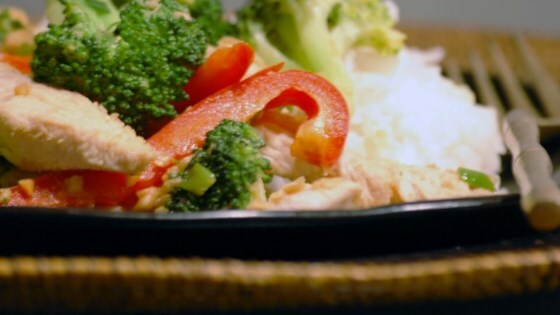 "This is a very tasty Asian-inspired dish made with chicken and broccoli in a spicy peanut sauce. If you like it mild, use less cayenne, like it spicy, use more. If you're salt conscious, use low sodium soy sauce." Combine the rice and water in a saucepan over medium-high heat. Bring to a boil, then reduce heat to low, cover, and simmer for 20 minutes, or until rice is tender. In a small bowl, stir together the soy sauce, peanut butter, vinegar, and cayenne pepper. Set aside. Heat oil in a skillet or wok over high heat. Add chicken, garlic and ginger, and cook, stirring constantly, until chicken is golden on the outside, about 5 minutes. Reduce heat to medium, and add green onion, broccoli, peanuts, and the peanut butter mixture. Cook, stirring frequently, for 5 minutes, or until broccoli is tender, and chicken is cooked through. Serve over rice. this is a very tasty (although not particulary authentic) dish. one thing: next time i'm going to halve the garlic. 3 tbsps was a little overwhelming.